Senior guard Mei-Lyn Bautista drive toward the basket during last week's game against Monmouth. Women’s basketball appeared unable to get out of first gear in a loss to USF Sunday afternoon. GW (2–8) failed to register double-digit points in any quarter as the Bulls (7–2) dominated and picked up a 63–30 win, leading the game from start to finish. USF came into the contest among the top teams in the country in rebounding, averaging 13.4 more boards per game than its opponents. The Bulls beat the Colonials 47–31 on the glass. The loss matched GW’s worst offensive performance of the season, when the team scored 30 points against then-No. 9 Maryland in November. Sophomore forward Chyna Latimer led GW in scoring with nine points. Senior guard Mei-Lyn Bautista, coming off an 18-point performance against Villanova, was limited by USF’s defensive effort – going 0-for-7 from the floor. The Colonials ended the night shooting 21.4 percent from the floor – nearly 22 percentage points lower than the Bulls’ 43.1 percent clip. The Bulls were led by freshman center Beatriz Jordao, who tallied 14 points and four blocks in just 17 minutes of action. Sophomore guard Enna Pehadzic also had 14 points after going 3-for-4 from beyond the arc. USF went 14-for-17 from the free-throw line and scored 18 points off of GW’s 12 turnovers. Head coach Jose Fernandez was forced to start three freshmen due to numerous injuries to his roster. GW’s offense did not fair well in the first frame, managing just six points. Latimer led the way with four points, but the Colonials shot a 3-for-18 clip as a team and failed to make any shots from behind the arc. The Colonials’ offense improved in the second quarter after Rizzotti put in an almost entirely new lineup. 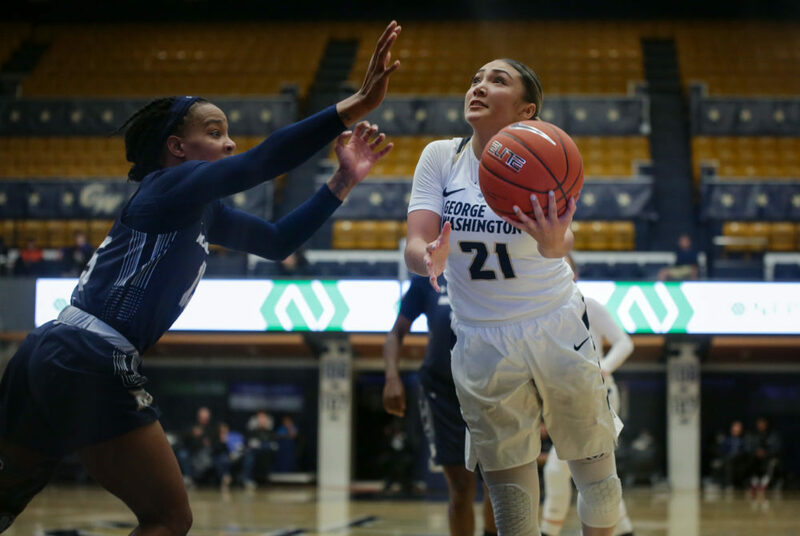 Redshirt sophomore forward Sarah Overcash was the only starter to play significant minutes as GW put up nine points as a team. The Bulls also improved their play despite Jordao sitting out the majority of the quarter. USF tallied 15 points in the second quarter alone and had eight players score as they entered halftime with a 29–15 lead. Bautista was benched for nearly all of the second quarter after shooting 0-for-5 from the floor. Freshman guard Maddie Loder logged 16 minutes in the first half, more than any other Colonial. Senior guard Laura Ferreira entered the game averaging 17.6 points per game for USF but had just three after the first half. The Colonials managed to shut her down but Jordao and the balanced Bulls attack did the damage. GW started the third quarter by going 0-for-5 from the floor. A free throw from redshirt sophomore forward Olivia Gumbs was the sole tally for the Colonials until sophomore forward Neila Luma scored a layup more than halfway through the quarter. Luma added another bucket soon after and senior forward Kelsi Mahoney drained GW’s first and only triple of the afternoon with one minute remaining in the quarter. The Bulls had their worst offensive output of the game in the third quarter, shooting just 26.7 percent from the field, but still led by as many as 23 points. USF played its best basketball in the final 10 minutes, racking up 22 points in the fourth quarter. Junior center Alyssa Rader scored seven points in the final frame, as many as GW’s entire team. The Bulls closed out the contest shooting 63.6 percent in the fourth and knocking down all six of their free throws to finish off the Colonials. The Colonials have 11 days off until their next matchup. They host Mercer on Dec. 21 at noon.